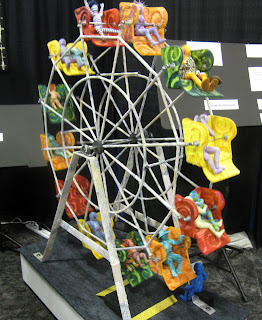 Last Friday I went to the Road to California Quilter's Conference and Showcase in Ontario, CA with my buddy Zina and something surprising happened - I did not purchase anything...well except for lunch. I told Zina while we were on our way to the show NOT to let me buy any quilt kits and other than eyeing some really lovely Anna Maria Horner Velveteen for $22.95 a yard (ouch), I came home empty handed but with my camera full of photographs to share. Before I begin I have to say that every single quilt we saw was truly a work of art and although we did not like everything we saw, all was appreciated for the skill and talent that went into each piece. Quilting is such an underrated art. First Zina and I viewed the faculty quilts - which I have to say I had no idea what that meant until I learned that the faculty were those whom were teaching the classes going on during the show. Life on Holly Ridge by Nancy Prince. 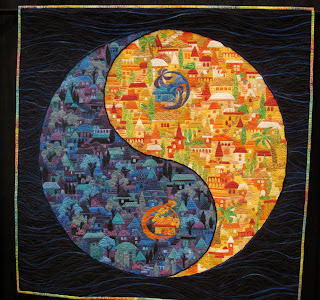 Nancy Prince is a quilter who thread paints her quilts. According to her website, Life On Holly Ridge took her over 1,500 hours to complete. It was so realistic - it looked like a photograph to me. Nancy Prince - Life on Holly Ridge 75" x 54"
Seeking Balance by Karen Eckmeier. As soon as I rounded the corner of the faculty exhibit and saw this quilt I wanted to go here. 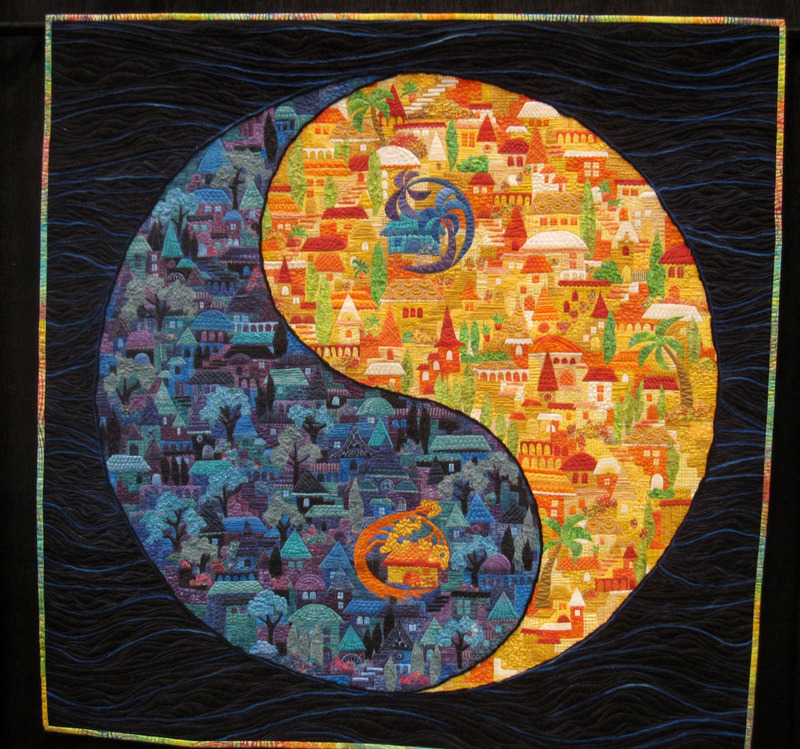 Red roofed buildings, swaying palm trees and the play of night versus day made this quilt very appealing to me. Seeking Balance by Karen Eckmeier 44"x 44"
We then moved onto the judged quilts of many different styles and techniques. 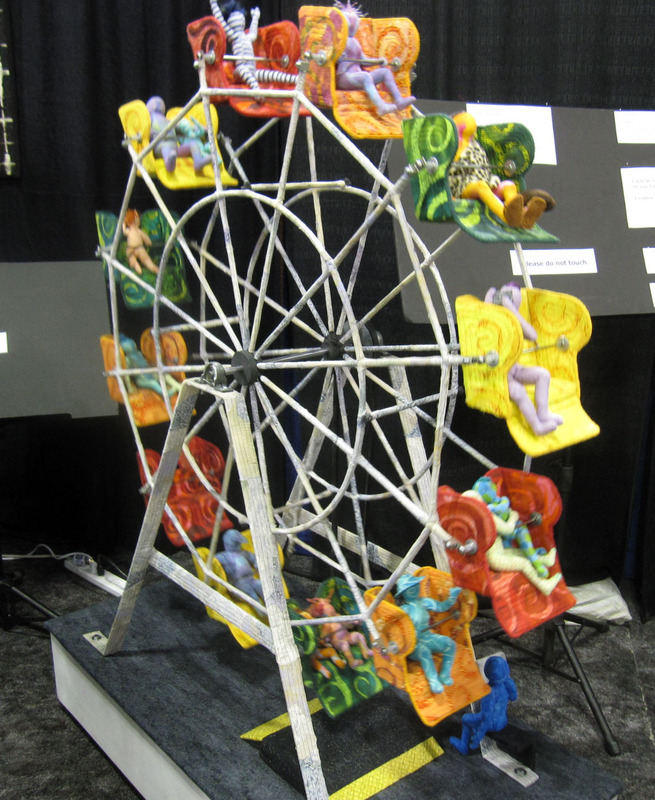 This next photo is obviously not of a quilt in the traditional sense but is a sculpture that is "machine-collaged/quilted surface over armature of plastic board, polystyrene foam, steel and fiberfill". The artist, Susan Else - had a large showing of her pieces at Road2CA - please visit her gallery page here to see more of her amazing creations. This one was moving! Oh and then we saw a quilt map...I love maps. 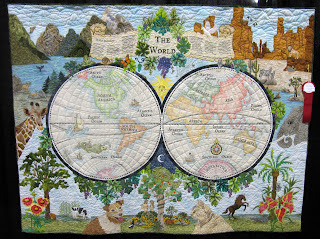 The quilt maker, Rachel Wetzler describes on her website that the inspiration for this quilt was antique maps. The next one I found very interesting as it reminded me of flags all lined up in a row but in this case it was individually made quilt panels that could stand on their own, but when brought together create a lovely image of Humbolt Bay. 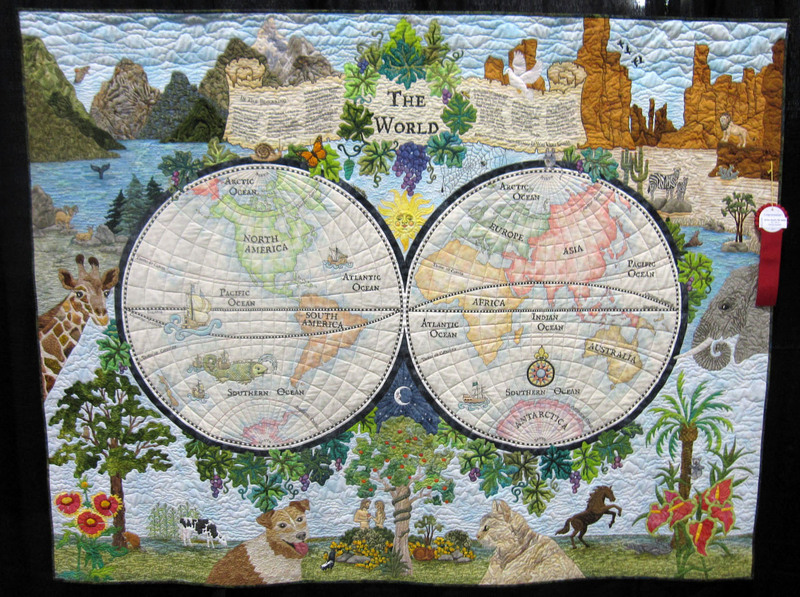 The description of Eureka!, quilted by Pat Durbin, stated that it was a group planned piece but individually made with each artist using their own technique. Go visit her gallery here for more stunning examples of picture quilts. Eureka! 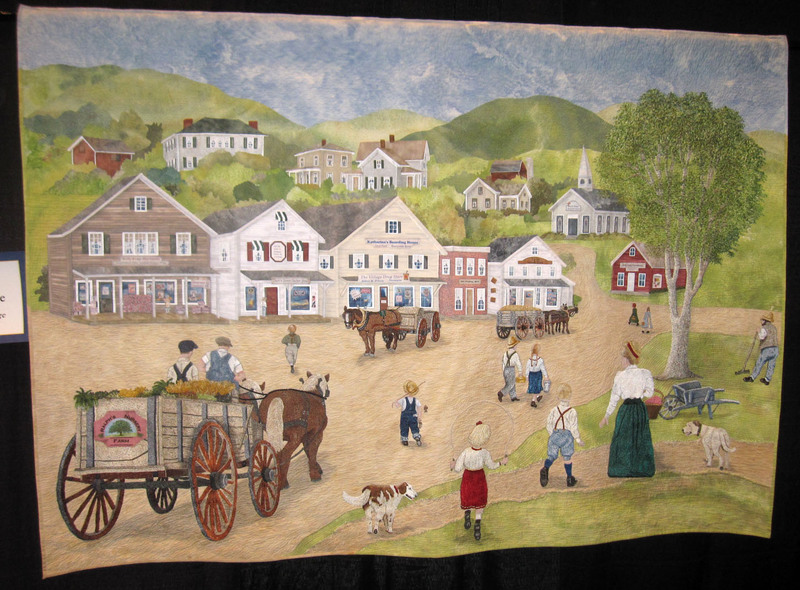 by Pat Durbin 104"x 45"
And then we were "Star Struck" by this amazing beauty that was made and quilted by Cheryl L See. 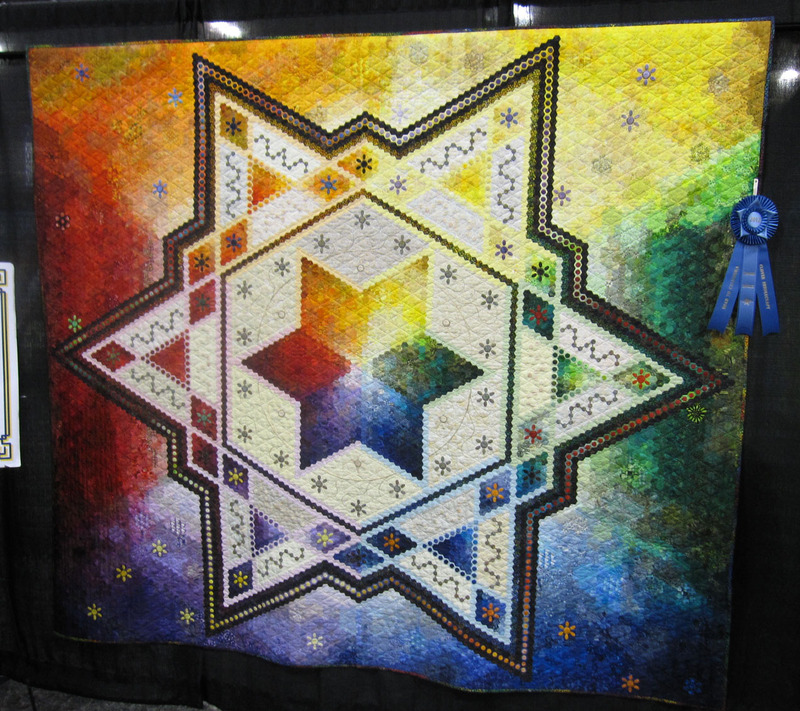 12,256 handpieced hexagons made up this quilt and she won first prize for the Innovative Mixed category. Kinda felt like playing Chinese checkers after I walked away from this one. It was gorgeous. 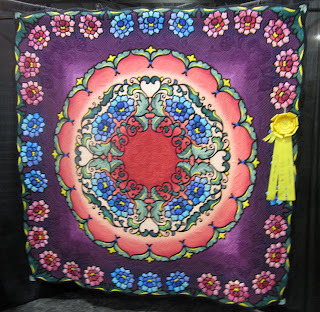 The Road2CA Quilters Conference and Showcase 2012 Best of Show winner was Everlasting Bouquet. This beauty was made by Molly Y Hamilton-McNally and quilted by Cindy Seitz-Krug. Those talented ladies won $3,000 for this quilt. The description stated that Ms. Seitz-Krug quilted it on her home machine. The show was exactly what we wanted it to be - inspiring and encouraging as we both talked of how we couldn't wait to get to our machines to sew. Put me in the mood for Mid-Atlantic in February! Someday I'll get to RtCA--seems like a fun one. It is always a great show. I'm machine quilting today, inspired by my machine quilting class I took at Road. Those quilts are insane! It is so amazing what people can do with fabric and thread. I can't even imagine spending 1500 hours on one project. Glad you had fun and got to spend time with a quilting buddy! There were so many amazing quilts, it was hard to choose a favorite. The "Seeking Balance" quilt was definitely towards the top of my list. 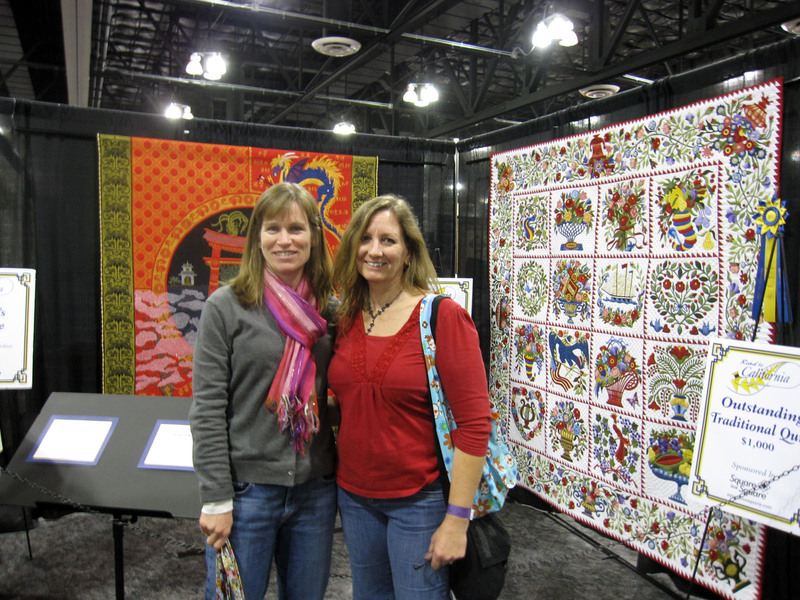 I had such a great time with you, Susan, and I'm looking forward to our next quilting adventure! Hi Susan... did you happen to get a picture of a patriotic quilt that was on display? I've heard how amazing it was, but hadn't seen any pics. If you, can you post?